Aerial navigation is basically identical to any other type of navigation. 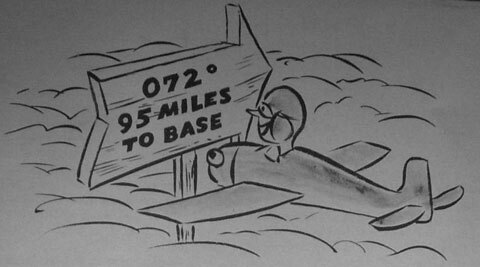 It is the science of finding and following the most expeditious route through the air from one point to another. Applied to aircraft control, this destination may be an island, an airfield or a moving carrier base, a specific geographic or relative sector to search, or a point at which another moving plane may be intercepted. In order to understand the movement of aircraft for purposes of exercising control, a clear conception of relative motion is essential. Relative motion of aircraft presents a much more complex problem than the relative motion of surface vessels. For example, with your ship underway you are to give a plane near you a heading so it can join another that is passing at some distance. The motion of the wind, your ship, and certain instrument errors must be considered. Briefly, the instrument errors in the plane are caused by its altitude and the temperature. The corrections are made with certain tables and devices, such as the Mark VIII Computer, which will not be discussed here. The first motion that affects the plane's actual movement from one point on the earth to another is the wind. The wind is actually a movement of the air that is supporting the plane, so it will obviously have an effect on it. In considering the direction of wind it is important to remember that the direction given is normally the direction from which the wind is blowing rather than the direction in which it is blowing. This terminology differs from that used in describing other types of motion. direction the wind was blowing. Here its Heading is the same, but its motion over the earth shown by the dotted line is different. 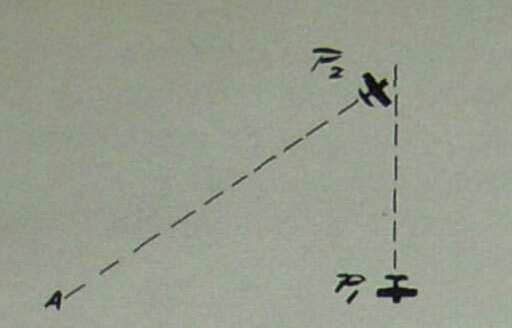 The dotted line is called the Track of the plane, its actual movement over the earth. 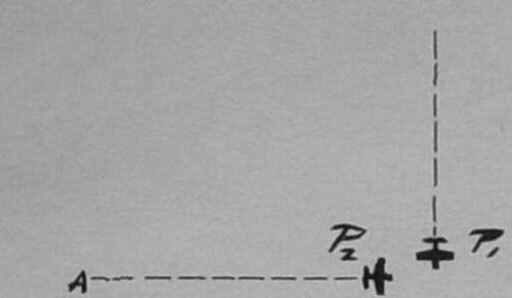 The direction of the dotted line is called the Course of the plane and the speed of this motion is Ground Speed of the plane. 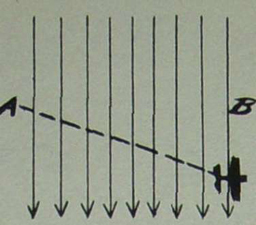 True Heading should be distinguished from Magnetic Heading which involves an adjustment in the Magnetic Heading of the plane to compensate for error caused by Variation in each given area of operation; this adjustment in Magnetic Heading will cause the plane to fly the desired True Heading. Motion consists of direction and speed. Relative Motion is the direction and speed an object appears to move when observed from another moving object. Example: You are on a ship moving south. You see a plane east of you at Point A at time 0800. At 0801 you observe the plane at Point B still due east. The plane appears to have moved from A to B. This is the relative motion of the plane with respect to the ship. The direction of the line from A to B is called Direction of Relative Motion (DRM). The speed of the movement from A to B is called Speed of Relative Motion (SRM). The distance from A to B is the Measurement of Relative Motion (MRM). This is the movement that would appear on your relative plot board. However, you have been moving south during this time. At 0800 you Were in position 1 on the earth's surface and observed the plane at Point A. At 0801 you were in position 2 on the earth's surface and observed the plane at Point B. Hence the dotted line from A to B is the actual movement of the plane over the earth's surface. This is the track that would appear on your DRT plot. and ship's motion will be omitted to simplify the example. Example: P2 is at Point A. Pi is flying south at a given speed. It is clear that if P2 were given a heading straight at Pi the planes would not meet as Pi would have advanced along its course. P2 will be given a heading to a point somewhere ahead of P± so that the two will arrive there simultaneously. 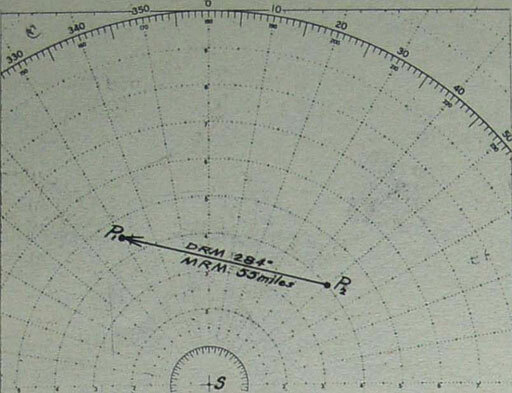 Computing their headings as well as calculating the wind and ship's movements makes use of a vector diagram. As stated before, motion consists of a speed and direction. It can be represented by an arrow pointing in the direction of the motion, with the length of the arrow measuring the speed. The vector is labeled with the object in motion at the arrow end and what the motion is relative to at the other end. 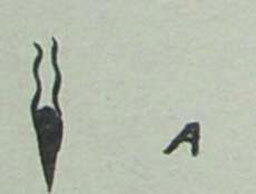 Small letters are used, which are descriptive of the objects involved. Example: The motion of a plane relative to the earth in direction 090 at a speed of 150 knots, i.e., its True Ground Speed, and Track. The basic rule for joining vectors is that ends having common designations may be joined one on the other if their proper slope or direction is retained and if they are of the proper length based on some common scale. New vectors which may be constructed as a result of such joining have all the properties of the original vectors and may be read as describing the movement of one object in relation to another in the indicated direction at the indicated speed. This process is known as the solution of the vector triangle. top of the page and a common scale will be used to measure length of vectors, i.e., speed of motion. 1. The motion of the air (w) over the earth (e) from a direction of 220° at a velocity of 20 knots. 2. The motion of our ship (s) over the earth (e) in a direction of 180° at a speed of 30 knots. 3. The relative motion of a plane (Pi) which we have been plotting and determined to be in a relative direction of 074° at a relative speed of 169 knots. Joining the ends of these having common designations. Speed (TAS) of 150 knots; and (e-pj the motion of the plane relative to the earth, that is a track of 085° at a Ground Speed (GS) of 165 knots. 4. Now supposing we wanted to have a second plane (P2), which at the time was 40 miles from us on a true bearing of 050°, join the plane that we had been tracking (Px) which at the same moment was 45 miles from us on a true bearing of 330°. The plane (P2) is to use a True Air Speed of 180 knots. The relative picture of the situation at that moment would be as shown in figure 20. It should be understood that this illustration is that of a relative plot and not part of our vector diagram and as such the positions are labelled by capitol letters to distinguish them from parts of our vector diagram. It does tell us, however, that if Plane 2 is to join with Plane 1 that it must fly so that its Direction of Relative Movement (DRM is 284°), and we can measure the relative distance that it has to travel (MRM is 55 miles). From the information that we now have we can put down our Px-P2 vector. Draw a line from Pt in the direction 284° (DRM). We know that P2 is to fly at True Air Speed of 180 knots which gives us the length of w=p2. Swing an arc of radius 180 units with w as a center (figure 21). The length of Pi-P2, the SBM, is determined by where it is intersected by the True Air Speed arc. By measurement we find that the speed of relative motion is 322 knots. We can also see that the direction of the w=p2 vector is 295°, the True Heading of the plane (figure 22). and speed at which he would move across our plotting boards. With this fundamental concept of the nature of vectors and their combination into vector diagrams we can figure out the somewhat complex problems of the relative motion of any number of moving objects to one another.